A brand owner’s nirvana is the fanciful or coined trademark that reaches ubiquity amongst the masses; that is, until the masses are not using the trademark properly. Bayer, with its loss of the mark ASPIRIN for acetylsalicylic acid in the United States, and DuPont, with its loss of the mark CELLOPHANE for a thin, transparent sheet made of regenerated cellulose in the United States,1 can attest to the loss that results from competitors being able to use your once-original mark on the same types of products, and on the same shelves on which your product appears. Consumers can suddenly grab any box of cellophane from the local Target store to wrap-up their leftovers rather than the thin, transparent sheet easily identifiable as being manufactured by DuPont because it is labeled with the registered trademark CELLOPHANE. So, how do you prevent your brilliant trademark from falling into the genericised graveyard? Second, make sure that you monitor the use of those you’ve given permission to use your trademark. If you license the use of your trademark to third parties, be sure you have a monitoring program in place to review samples of the merchandise on which the trademark is used. Require that your licensee send you samples every year so you can confirm the trademark is still being used properly, and also perform spot checks at retailers and online where the merchandise is sold. Properly means using the trademark in the form in which it is registered, on the types of goods for which it is registered, accurately (particularly if the mark includes design elements), and not in a way that misrepresents the source of the trademark owner. With respect to this last aspect of proper use, you want to make sure that the third party using your trademark is not using it in a manner that would cause a consumer to believe that the third party is the actual owner of the mark. Third, make sure that you monitor the use of third parties, whether competitors or disinterested third parties. If a competitor is using your trademark to make a comparison between your product and their product, and they are not using the trademark properly, notify them and request they correct it. The same goes for a disinterested third party, such as a newspaper columnist or retail store. Write to the user, explain how the mark should be used properly, and request that they correct the same. Such written contact does not need to be heavy-handed, but rather it can be merely informative. Even if action isn’t taken to correct it, evidence of your attempts to police use of your trademark are often more important in preventing your mark from becoming genericised than evidence that the requested changes were actually made. 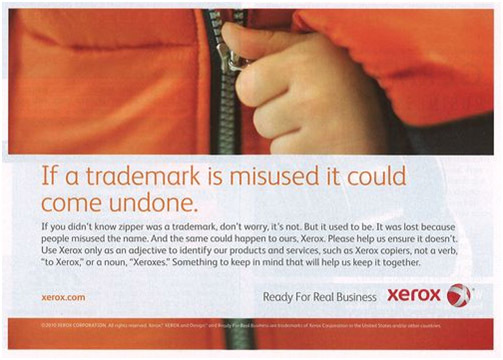 For example, the Xerox Corporation published an ad requesting that people use the term Xerox® only as an adjective. While the average member of the public probably doesn’t care if the Xerox Corporation uses the trademark Xerox® properly, the effort made by the Xerox Corporation has been cited as a reason why the term Xerox® continues to remain a protectable trademark. 4) whether the mark is registered on the U.S. Trademark Principal Register. Proving fame is difficult. Further, even those who own famous marks are finding it increasingly difficult to enforce their marks against perceived dilution in view of uses by third parties that are considered permissible. Third parties can use even famous marks without the owner’s permission to perform and advertise product comparisons, do news reporting, and use the mark in a noncommercial manner. It is even considered fair use to parody or criticize a famous mark, despite the owner’s consideration of that usage as tarnishing the image of the owner and the trademark. For example, Starbucks was unable to stop the use of the term “Charbucks” by a competitor coffee shop, and Louis Vuitton was unable to stop the use of the term “Chewy Vuitton’ by a pet chew toy company. Thus, if you do achieve trademark nirvana with your mark, you still may find it difficult to police possible dilution. Regardless, evidence of your efforts to stop such usage will ultimately be helpful in preventing your mark from becoming genericised. Now that we’ve covered the actions you can take to protect your successful brand, we’ll use the last two articles in our series to discuss strategies for building and protecting your brand in the wake of receiving your trademark registration. 1Notably, both ASPIRIN and CELLOPHANE are registered trademarks in other jurisdictions, e.g., Canada and many countries in Europe, demonstrating that brand owners should not consider a loss of rights in one country a loss of rights everywhere. 2To read more about why people often mishear lyrics, read this interesting article from The New Yorker by Maria Konnikova. 3See 85 U.S.P.Q. 80 (Comm. Pat. 1950). This update was prepared by Peter Nils Baylor and Rory P. Pheiffer. For more information, please contact Peter, Rory, or your Nutter attorney at 617.439.2000.